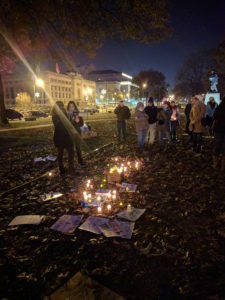 Later that evening, my husband and I went to a vigil downtown to remember all those less fortunate than ourselves. Specifically, we remembered Syria, and all those who died this week, and are still dying every day. It was surreal and heartbreaking to receive their final tweets – people saying goodbye from half a world away, people who I had never met, will now probably never meet; reporters, humanitarian workers, regular citizens trapped and wishing for a way out. It’s heartbreaking to know that there is little that I can do. I inquired what it would take to get an approved, screened, ready-to-immigrate family from Syria to St. Louis. The answer, from our local rabbi, was, “Rent for a year, utilities, clothes (we ask for the sizes), a job and support.” It doesn’t SOUND like much. Compared to where I come from in Los Angeles, we have a lot of room in St. Louis. We have abandoned houses that sit in need of repair and occupancy. I’ve seen “help wanted” signs up in many places: delis and pizza places. It’s not grand, but it would be a life for someone and their family. 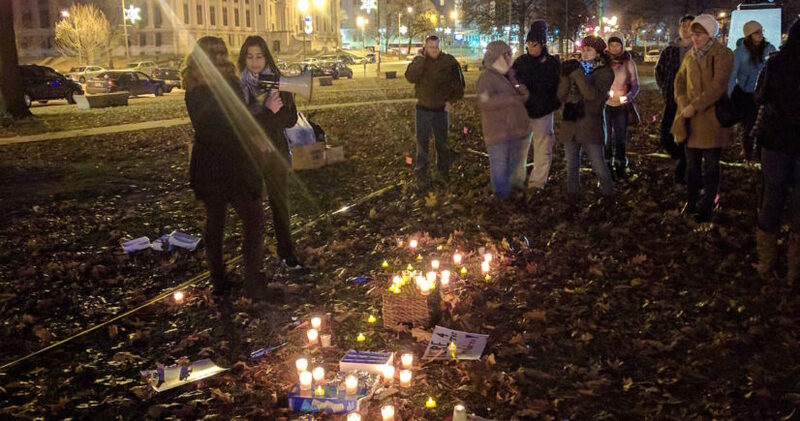 At the vigil there was a man standing in the cold, his face wrapped in a scarf, carrying a sign that said, “There’s room at my place!” Is that something that’s possible? That people with a room to offer could bring over, if not a family, maybe one person: a single individual, or someone who has become lost or separated from their family? That person could use that spare room as a base for trying to find their loved ones. At least she or he would be safe, and wouldn’t have to be alone somewhere out there in the cold while we all wait for something better to happen. I would love to look after a child from that region, but I know, because I checked with the US Department of Health and Human Services, that due to an accident of geography and the vicissitudes of bureaucracy, I can’t take in an unaccompanied minor from a worn-torn region. To do so, you must live in one of the cities that serve to re-home unaccompanied minors with the aid of the Catholic Church and the Lutheran Ministry. In order to take in such a child, you have to work with a local organization in: Arizona, Colorado, California, Florida, Georgia, Illinois, Maryland, Massachusetts, Minnesota, Nebraska, New Hampshire, New Mexico, New York, North Carolina, South Carolina, North Dakota, South Dakota, Texas, Oregon, Pennsylvania, Virginia, or Washington. Missouri isn’t on the list. Because each state in our union has its own set of adoption laws, refugee children taken in but one state can’t cross state lines to be re-homed in another. While I have the room, but I’m not in the right state to help that kind of child. I don’t have an entire apartment to lend an entire family, though. It leaves me feeling very much as though I’m standing in the middle of an icy pond: within site of many members of my species, but not close enough to make any sort of real difference. I console myself with believing that we’re half way through the dark, somehow. I have no idea if that’s true or not, but the thought is cheering. It’s enough to keep me moving forward into the next year, when, somehow, I might find some way to really help.